Inducted 2009. Member of Two State Championship Teams, Was Class A Individual Medalist as Junior. Dan Citro will certainly be remembered most for winning the Class A individual state golf championship as a junior, but the year he didn’t even qualify for the state tournament may have shown his character most. Citro, a 1999 graduate, didn’t attend QND until his sophomore season and was ineligible to play because of IHSA transfer rules until his junior season. Just before regional play started that season, Citro received a copy of the book, “Golf Is Not A Game Of Perfect,” which focused on the mental aspect of the game. 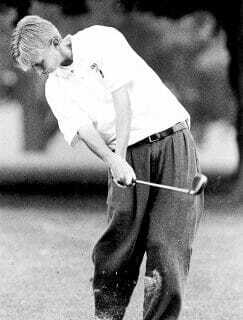 The admittedly hotheaded Citro used the lessons learned from the book to help him shoot a 142 at the state tournament in 1997, the third-lowest score in state tournament history at that time. He also helped the Raiders claim the Class A state title. His quest for back-to-back individual state titles ran into an unexpected roadblock in the sectional at Monmouth. He lost three strokes on one hole when his ball was apparently lost in a drainage hole, and that cost him a chance to qualify for the state tournament. Citro rebounded the next weekend to shoot a 158 at the state tournament (which would have placed him in the top 10 individually) and helped the Raiders claim back-to-back state titles. Citro went on to play golf at Quincy University, where he received his degree from in 2003. He is now working on his master’s degree at the University of Notre Dame. I wish I had one swing back. Second shot on the 18th at Prairie Vista during the State Tournament, senior year. I had 175 yards, middle of the fairway, hard crosswind from the right. Six iron. I flushed it. I can still feel the ball melting into the clubface. But it was a loose swing, and the ball ballooned and landed on the parking lot. It was costly. In the end, things worked out well, as things always seemed to at QND. I would like to thank those who taught me the game: Nan Ryan, Mark Christensen, Lynn Rosely, and my parents. I’d like to extend further thanks to my teammates at QND, who both put up with my various eccentricities and gave me a great set of memories. And they brought their games. I’d like to offer a special word to Coach Longo and Charles Scholz. I arrived at QND as a skinny little sophomore, and Coach Longo immediately made me feel like a member of the team—not only a member, but a piece of what they were building. It was his initiation that allowed me to enter my junior season as something like a veteran player filling a key role on the team. Charles and I had played golf together for years; before we became teammates, we were two kids who played golf all day. During a 3-year stretch in our early teens, I’m quite certain I never saw Charles miss a putt inside of six feet. Thousands of putts. All made with the ugliest putter in the world. It drove me mad. But, Charles is a great teammate and a real leader. I followed him, and it was Charles more than anybody that brought QND golf its back-to-back state championships. To close, I’ll say this: I was a member of the QND golf team for two years, and in that time they gave me three state championship medals. I still get a kick out of that ratio.